I was looking through a Milan Kunc book I bought recently and spied a milk carton, similar to the ones I painted in 1997 (mentioned in this blog) and also in my 2008 painting 'Travelling May Induce Calcium Deficiency'. We both have used a 'milch' label, which I decided to use as when we were travelling around Germany in 2008, there was some conspiracy with dairy processing plants in Germany at the time - something to do with milk tampering of some sorts. 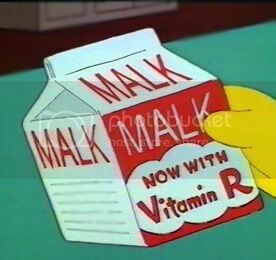 I also included 'malk' which comes from a Simpsons episode where Springfield Elementary needed to make budget cuts so they supplied the students with 'malk'.